Yesterday I drove up to Wisconsin to get some new tattoos with my twin sister and my new friend, Melissa. I had a blast! This is my left wrist. It’s an “S” with the birthdays of my boys and my wedding anniversary. 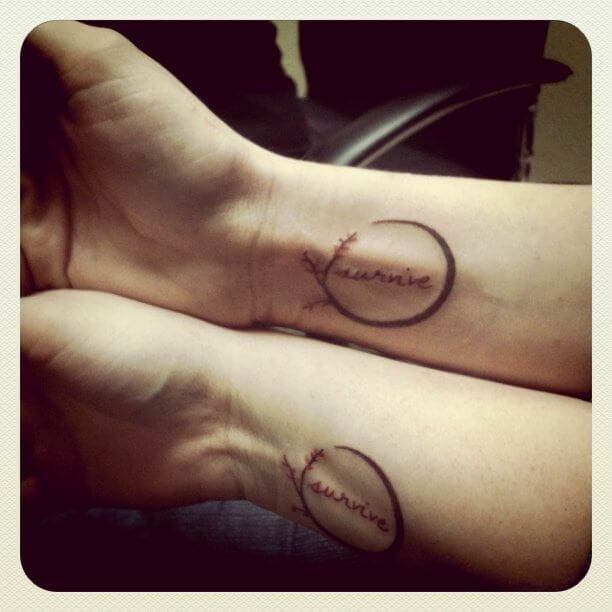 This is my right wrist, a tattoo my sister and I decided on because of a lot of circumstances we’ve had to deal with. It’s a dark branch with autumny colored leaves and the word “survive” in the middle of the branch. I’m the bottom wrist in this photo. Do you have any tattoos? Details! CUTE! I have two tattoos. Both on my arms. Hoping to get another soon. Thank you! My left wrist was a bit more painful to get done than my right for some reason. Well my tattoo on my left arm takes the whole inside of my forearm. It hurt most closest to my hand and by the bend of my elbow. It think it was hitting a nerve. Oh yes, the parts closest to where my wrist bends on my left wrist, hurt the worst. I love them both!! I couldn’t tell on Twitter what your sister one said, but survive is a great motto to remind yourself every day. :) I love the colors on it! Simplistic and lovely. And the swirly S on the left is SO COOL!!! Beautiful design. Thank you!!! I love them both, the survive one is the only one I have with color, my other two are just black. They are so beautiful! Strong yet delicate at the same time :) Where did you get them? Thank you! We got them done at http://skincandytattoo.com and our artist was Jenny. She was lovely! I’m getting wrist tattoos too, for my 40th birthday in a few months. I’m so excited. I’m thinking cherry blossoms. Did it hurt? Oh yes, ALL tattoos hurt however because it’s an area with thin skin and a lot of nerves, it’s a bit more painful than say your neck, back, or even upper arms. I have a butterfly on my shoulder and a Celtic knot symbolizing forever on my back (Munchkin’s parents both have that tattoo as well). I’m working on a new one, but I can’t decide! OHH the worst for me is figuring out WHERE to get mine, then I can generally narrow down WHAT to get. After my sister and Melissa got one behind their ears, that seems like where I want my next one. I have a wrist tattoo as well, and it hurt like a mother, but as soon as it was done I said “I want another one right now!” They’re so addictive. My tattoo is the Celtic tree of life because I am a firm believer in connectivity and a cyclical universe. My next tattoo will be a very realistic looking honey bee on my foot, a little larger than actual size, because a) I call my boyfriend “honey-bee” lol, but more so because I admire bees because without pollinators we would be doomed. They’re an important part of agriculture. OH yes my wrists hurt WAY more than my neck ever did! They are addicting, by the time my second wrist was done, I was already pondering where to put another one lol. PS: LOVE the new background and header and colors! Gorgeous tattoos. I like the one Joni designed for you a lot! I’ve always wanted to get a tattoo, but never have. Thank you! I think Joni is a freaking amazing artist. My husband is like that, he sort of kind of wants one but has no idea what to get, I’m sure me bitching about the healing process isn’t helping either LOL! That’s my thing… I would not be able to figure out what to get. I have thought about it before. How have you come up with the designs for your other tattoos? The Imagine on my neck, my best friend Mary came up with that with the artist. 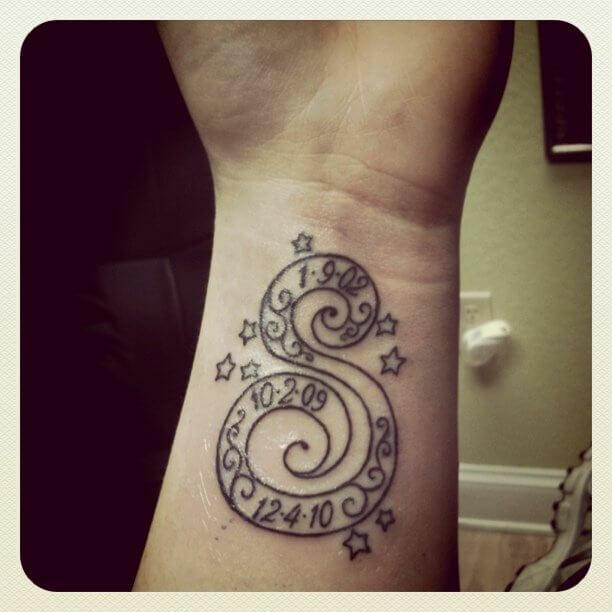 The one on my left wrist, I knew I wanted something with stars and the dates and Joni did the rest. The one on my right wrist, “survive” is a very strong word and my sister and I grew up in a very abusive household until I left at 17 and she left at 20-something. The autumn coloring is because our birthday is in October and the branch being a circle with a break it it is to show the BREAK in the cycle of abuse. 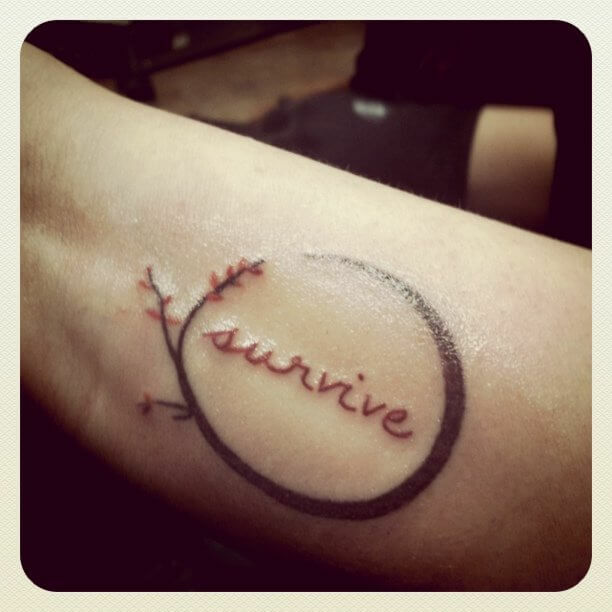 So much meaning, especially in that SURVIVE tattoo! I just don’t think I could come up with an image that means so much to me and I certainly don’t want to go picking something out of a book. Such beautiful tattoos! I’ve always wanted to get one, but I’ve never settled on a design. I’ve always thought if I got one I’d want it on my inner ankle. What I like about your tattoo’s is they are timeless. They will never look “dated” and they aren’t some kind of a phase you are going through. Simple, yet beautiful and packed full of meaning. Very nice! Thank you so much! I would never be able to get a “trendy” type of tattoo, it would drive me nuts! I love the tattoos. The survive one is awesome. I have three; a sun & moon that needs to be retouched above my left ankle, a butterfly on my right calf, and a purple lotus on my upper back which is my favorite. Thank you! I would love another celestial type of tattoo eventually, I just don’t know WHERE yet. Your tattoos are absolutely beautiful! I have no tattoos (yet), but ones like yours make me want to get one. I have heard from my sisters and friends that once you start, it’s hard to stop. Thank you! Oh yes, it can be a bit addicting for sure. By the time the artist finished up my second wrist, I was pondering if we had time for a THIRD tattoo somewhere lol.